Hey everyone! I'm getting a lot of people asking for practice tests and study materials for taking their Journeyman / Master Electrician exams. I passed my Master Test on the first try and it's only because I studied for a year before taking it. The Journeyman test is pretty difficult as well, but not as bad as the Master. I've decided to scan some notes and practice tests that I've used. There's a lot more coming but until I get the books and guides I've borrowed out to friends this is all I've got. In another post I'll also recommend some books and magazines for those of you actually taking this whole studying thing seriously. STUDY!!! The best way to pass this test ahead of you is to do as many practice tests as you can get your hands on before ever setting foot in that room. It's not about how much of the NEC you can memorize...nobody does that. The test is about how much of it you can quickly find. When you're sitting in that test room make sure you take this test methodically. 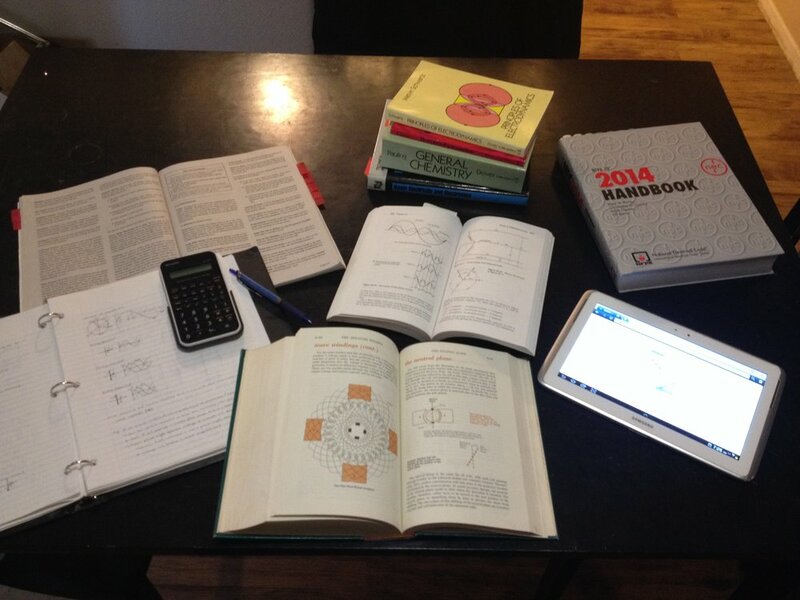 There is a right way and a wrong way to take a 4-hour (5-hour for Masters) timed exam. Take the first 10 minutes and go through the entire test from beginning to end and only answer the questions you KNOW 100%. After that go through a second time and answer the questions you can find in under 2 minutes. This will get you a couple hours into the test and ensuring that you have everything correct up to this point. NO GUESSING!!! If you have to guess...skip it. Do not answer it if you're just going to guess. Once you've gotten all the way through the second pass, take a 60 second breather. Now you've seen the entire test twice front to back. You know what questions are huge time-wasters (calculating multiple motor circuits, service load calculations, conductor ampacity/pipe fill - mostly math-based questions that require flipping through multiple tables and areas in the code book; and what questions are just difficult to find (wind turbine, electrified truck parking, mobile refrigeration, specific cord and conductor properties and uses, and pretty much anything in grounding (Art 250). Begin your third pass by trying to find the difficult-to-find questions. Try to limit your time on this to under 3 minutes per question. If you have to stretch it to 4 minutes on a couple that's fine. But if you have 25 questions left and an hour to spare, that ONE extra minute per question adds up to a wasted half hour in a hurry! After you've found MOSTLY everything that you can find, but are still missing a few...leave them alone and move on. If you finish early you can mess around trying to find them later. At this point go to the quickest math questions. Only answer what you can in 3-4 minutes, if it takes longer skip it (AGAIN). The theory here is that you're narrowing down your questions answered correctly to 75% or more. (ex. if you are taking a 100 question Master test, once you've guaranteed you've answered 75 questions right the rest do not matter. You've already passed. Now don't be stupid and assume that you've gotten all of them right, and stop trying after 75..then fail the test because you were wrong on one. STILL TRY TO ANSWER EVERY QUESTION RIGHT. YOU MAY HAVE MISSED 10 QUESTIONS YOU THOUGHT WERE RIGHT!!! Finally you should (hopefully have 10-20 minutes to spare before the test is over. With this time left try to squeeze in anything you think you have a shot in hell answering that you've left blank. If you have to guess, at this point its' fine, but make sure you're giving educated guesses. Don't just fill in "C" for everything. You have a better shot at reading the question and eliminating the ones that make absolutely no sense. Then picking between 2 options rather than guessing at 4. Click "Finish Test" and prepare for the cold beer waiting for you at the gas station. Regardless if you pass, this test is a mother fucker and damn it you deserve a ice cold brew! If you have any more questions or need any help, PLEASE reach out to me. Either email me at dustin@journey2master.com or leave a comment on the Journey 2 Master Facebook page. (follow it first). Or DM me at twitter, youTube, instagram...you get the idea.